As the summer heat waves finally start to break, and the morning air just starts to hint at cooler things to come, manufacturers are hard at work putting the final touches on their lineups for Fall 2017. 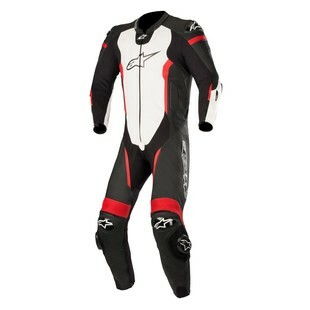 First up so far in Alpinestars, and they are starting off strong with a new addition to their one-piece race suit line, the Alpinestars Missile Leather Suit for Tech-Air. Getting right to the point, the Missile Suit is the least expensive access point to the Alpinestars Tech-Air airbag system. Just like with the current GP Pro Leather Suit, the Tech-Air system is sold separately, but the Missile suit comes in around $400 less than the GP Pro. Structurally, you still get a 1.3 mm perforated leather construction, and we are very happy to see the DFS seam protection system move from the shoulders to the knees. Also making the move down to an entry-level suit is a removable and replaceable elbow slider for all those up-and-coming racers out there. Overall, we're happy to see Alpinestars offering a less-expensive entry into the world of Tech-Air track protection. Considering the Missile Race Suit is getting most of the features of the GP Pro setup for almost a quarter off the price, that sounds like a great deal to us, and we foresee this suit being a hugely popular option for next year's race season.